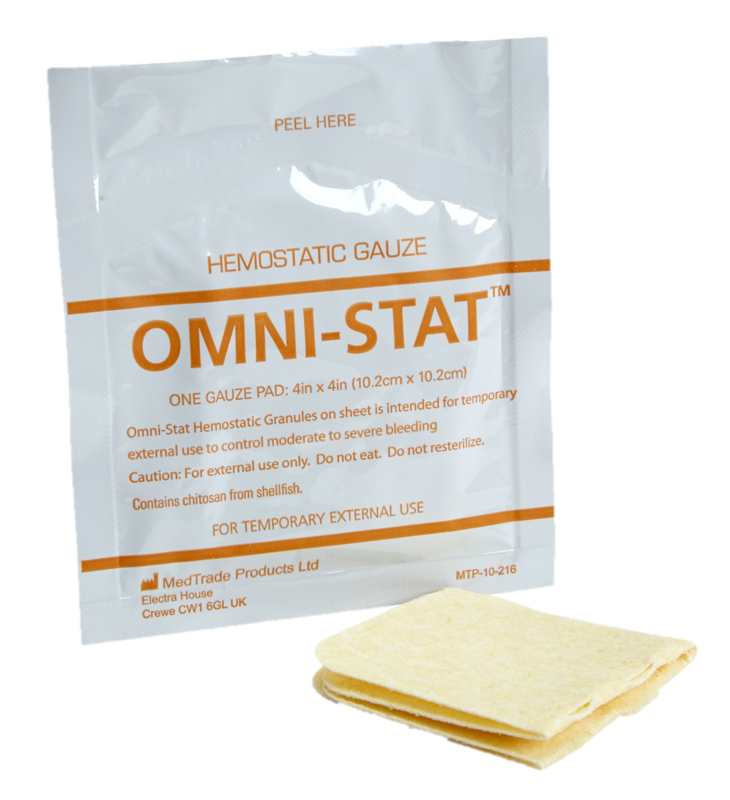 Omni-Stat™ works by absorbing fluid from the blood and gelling, to create a mechanical plug over the bleeding source16. Studies support that this mechanism of action works independently of classic coagulation pathways17. 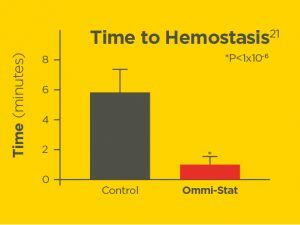 In a 40 patient study on chronic wounds after sharp debridement, Omni-Stat demonstrated significantly reduced time to achieve hemostasis, at the same time reducing patient discomfort and improving wound bed appearance21. 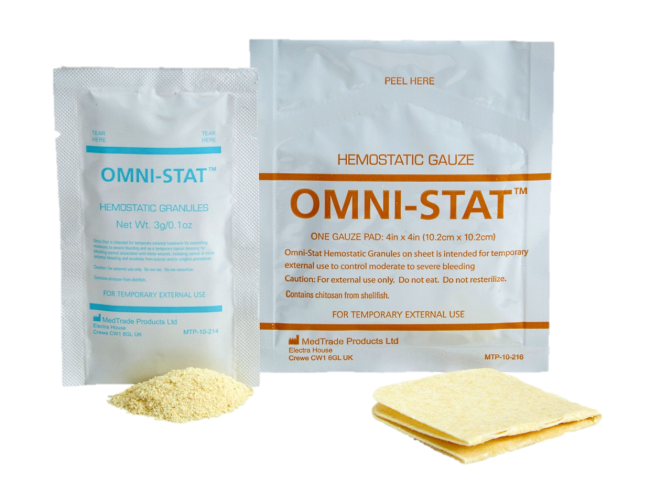 The Omni-Stat range of hemostats are indicated for external use in moderate to severe bleeding including debridement, topical procedures, podiatry, ENT, Emergency Department or ICU use. Omni-Stat has been tested clinically with effective results in a range of patients following debridement17. Omni-stat hemostats are indicated for use under the direction of a physician. 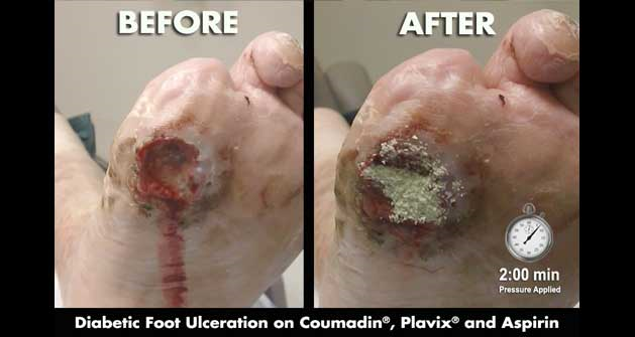 Diabetic foot ulcer patient on Plavix, Warfarin and Aspirin before and after 2 minutes pressure to stop bleeding. 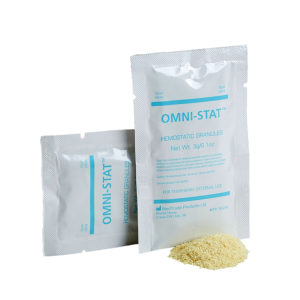 Omni-Stat is available in 2 preparations. Gauze 4×4 inch pads and 3g sachet of granules. Omni-Stat granules are effective even on blood containing Heparin or Warfarin.